Peter Kutemann, President of Monaco Impact, and Fabrice Marquet, Director of MonacoTech, have just signed a Convention aimed at creating targeted links between members of Monaco Impact, who will be able to act as mentors and/or investors, and interested MonacoTech project leaders. Through this Convention, these two entities, which have shared objectives, seek to help start-ups and innovative projects to develop in the Principality. 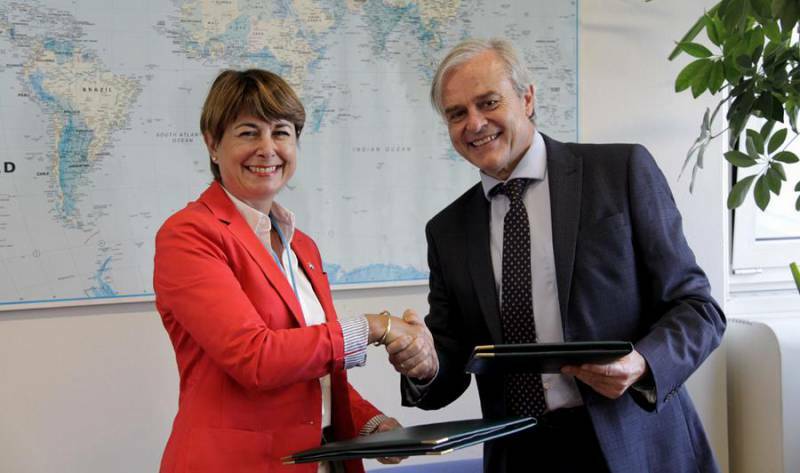 On 20 September, Ambassador Isabelle Berro-Amadeï, Permanent Representative of Monaco to the UNODC (United Nations Office on Drugs and Crime) and Jean-Luc Lemahieu, Director of the Division for Policy Analysis and Public Affairs at the United Nations headquarters, signed a new Partnership Agreement in Vienna, the aim of which is to continue assisting victims of human trafficking in Senegal, especially with regard to children. The Prince’s Government is particularly committed to protecting vulnerable children, and has been working in association with the UNODC on this issue since 2011. This partnership has already made it possible to provide direct care for 200 victims and offer support with setting up a national anti-trafficking unit, as well as providing training for Senegalese judges and police officers in handling specific cases. In Senegal, more than 100,000 children are forced to beg on a daily basis.